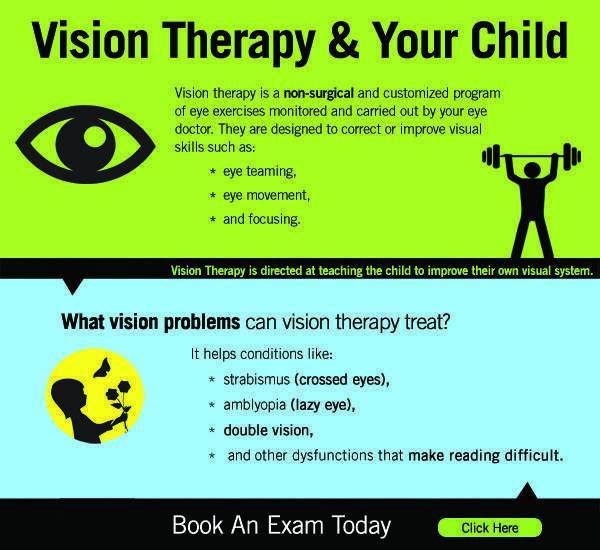 Vision therapy is a doctor-supervised program designed to improve eye coordination and visual functions, and includes treatment of amblyopia (lazy eye), strabismus (eye turn), non-strabismic binocular vision disorders, and vision-related learning difficulties, as well as post-concussion rehabilitation. These conditions often have symptoms including intermittent blurred vision, double vision, headaches, and eye fatigue. Rather than simply improving visual acuity, vision therapy focuses on eye functions, including eye teaming, tracking, visual efficiency, and visual comfort. It is a scientifically based program which, when combined with dedicated participation, can have dramatic results. While eyeglasses and contact lenses are effective treatments for refractive errors like nearsightedness, farsightedness, astigmatism, and presbyopia, there are other vision conditions which corrective lenses cannot fix. Vision therapy often referred to as “physical therapy for the eyes and brain,” is a treatment program that consists of a series of “eye exercises” or activities that are prescribed and monitored by a trained optometrist, and are used to retrain the visual system to function more efficiently. The therapy program is customized towards the visual needs of each patient and is adjusted throughout the process to encourage further visual improvements. The human brain is remarkable in its ability to adapt to new information with remarkable speed and success. This is known as neuroplasticity and is the guiding concept behind vision therapy’s success. People with vision-related learning disorders form a large component of those treated with vision therapy. Vision is a complex process of both innate and learned skills, and when one or more of these skills are missing, vision-related learning delays may occur. These delays may occur independently or in conjunction with conditions such as strabismus, dyslexia, ASD, cerebral palsy, and Down’s syndrome. It is possible to learn the missing skills through vision therapy, mitigating or eliminating the vision-related learning delay. Vision therapy is conducted in 30 to 60 minute in-office sessions, once every one or two weeks. These are supplemented with exercises to complete at home. Therapy programs are typically between 10 and 30 sessions, depending on the conditions being treated and the dedication of the participant. Unlike simple exercises to strengthen eye muscles, in-office vision therapy changes the way existing eye muscles are used and develops new skills in order to provide long-lasting clear, comfortable, and efficient vision. We love helping our patients enjoy the beauty of life by improving their vision. At our vision therapy centre, we treat a variety of vision problems through retraining the eyes with special exercises and activities, these patients leave our program with dramatic vision improvement, heightened school performance, and positive self-esteem. Who can benefit from vision therapy? These vision problems are treatable, and are often overlooked at visual screenings. At Cowichan Eyecare, we help people overcome these challenges by addressing the underlying vision problem. Vision therapy is beneficial following concussions and other brain injuries. Vision affects every aspect of life, and if vision processing has been affected during the brain injury, it can greatly decrease the quality of life. Ideally, everyone who has had a brain injury should be assessed as early as possible for a visual component. There are many aspects of visual processing that can be damaged during brain injuries, from the ability to track moving objects, to the ability to efficiently and comfortably process peripheral vision. Often when the visual system is affected, people are unable to return to work or to the lifestyle they previously enjoyed. Some common symptoms of visual processing deficits include light sensitivity, general fatigue, difficulty reading or concentrating, discomfort with computer and screen use, and headaches. Vision therapy following brain injuries includes both passive (lens) and active techniques. Active therapies often include re-learning developmental visual skills which have been lost due to the injury. Unlike simple exercises to strengthen eye muscles, in-office vision therapy uses the neuroplasticity of the brain to reteach the visual processing skills that were lost. Vision therapy provides long-lasting clear, comfortable, and efficient vision, and relief of post-brain injury symptoms. Dr. Lamhonwah was born and raised in Revelstoke, British Columbia. 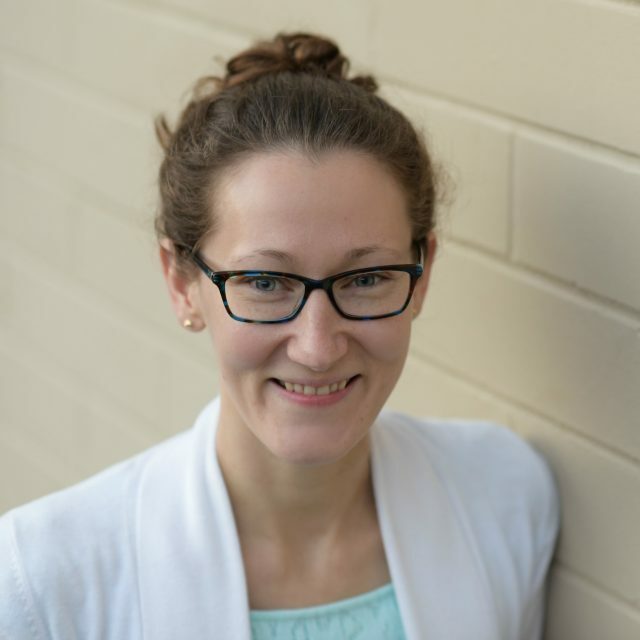 Rebecca completed the Science One Honours Research program at the University of British Columbia, followed by six years at the University of Waterloo to obtain her Bachelor of Honours Science and Doctor of Optometry degrees. Following graduation, she practiced in the Okanagan for two years before moving to the Cowichan Valley. When she is not in the office, Rebecca enjoys outdoor activities and spending time with her husband and young daughter. Rebecca is a member of the Canadian Optometrists in Vision Therapy and Rehabilitation and is excited to bring vision therapy for vision-related learning disorders and post-concussion rehabilitation to the valley. How can I enroll in vision therapy? A comprehensive eye examination is required to determine if vision therapy is an appropriate treatment option for you and your condition. Contact our office to book an appointment and learn more about vision therapy. How long can treatment take with vision therapy? Effective therapy requires visual skills to be developed until they are integrated with other systems and become automatic, enabling patients to achieve their full potential. The length of treatment varies between patients depending on the complexity of their condition and the specific needs of the patient. This may take as little as 10 sessions, or it may take longer. Vision therapy results can vary depending on each condition and circumstance. Successful vision therapy requires active engagement from the prescribing doctor, vision therapist, patient, and parents of any children enrolled in the program. With time, consistency, and hard work, patients can experience significant improvements in symptoms and efficiency in school or work-related tasks. Many school-aged patients often report increased reading speed, reading comprehension, and performance in school overall. Dr. Rebecca Lamhonwah is a member of the Canadian Optometrists in Vision Therapy and Rehabilitation.